Lectio Divina is an ancient way of praying the scriptures, dating back to Origen of Alexandria in the 3rd century, who introduced a way of praying the Scriptures that would unlock the message of Scriptural texts. The Desert Fathers and Mothers of 4th century Egypt developed the process, bringing it into daily use. Centering Prayer is a popular method of meditation, used by some Christians, placing a strong emphasis on interior silence. The name was taken from Thomas Merton’s description of contemplative prayer as prayer that is centered entirely on the presence of God. Although the modern movement of Centering Prayer owes much to the Trappist monks of Spencer, Massachusetts, in the 1970’s, including Father Thomas Keating, the roots of this type of prayer of the hearts, as it is known, traces it’s roots back to the early Desert Fathers and Mothers, to works such as The Cloud of Unknowing and the writings of St. Teresa of Avila and St. John of the Cross. 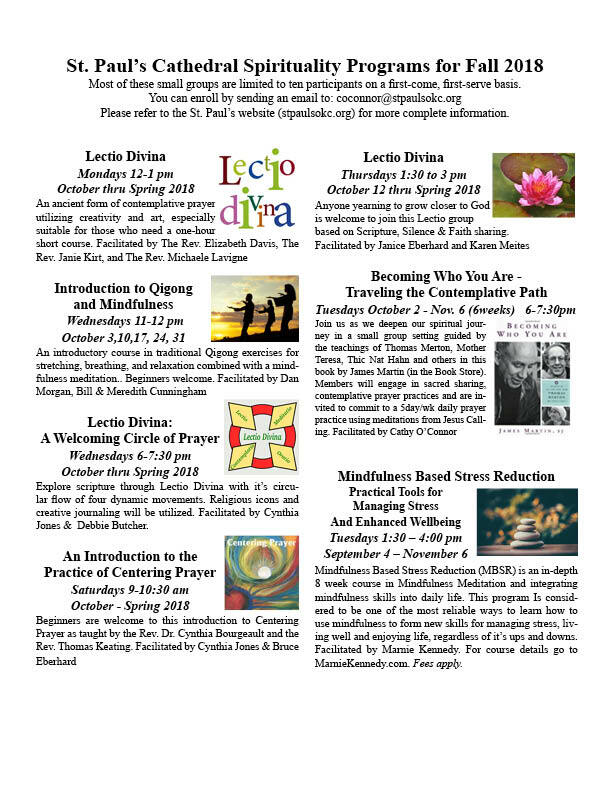 The Ignatian Exercises are offered at St. Paul’s as a 32 week program, beginning each September. The program is a comprehensive set of spiritual exercises, designed to help bring a soul into closer and direct relationship with God. The Exercises, which are Biblically and LIturgically based, remain in their original form as they were written down and codified by Ignatius of Loyola, in the 1500’s. Prerequisites for this intensive course of prayer are required, along with a personal interview, which must be completed by August for enrollment in September. Contact the Rev. Canon Susan Joplin, for more information. The labyrinth is a spiritual tool that has many applications in various settings. It reduces stress, quiets the mind and opens the heart. It is a walking meditation, a path of prayer ad a blueprint where psyche meets Self. St. Paul’s provides two major labyrinth walks a year in conjunction with the St. Paul’s Taize Choir: in Spring/Summer and in Fall/Winter. These walks are open to the public. In addition, many smaller walks are part of the life of St. Paul’s and have included walks for grief, healing from cancer, celebration of birthdays and other turning points in life. St. Paul’s currently owns 3 labyrinths: a 4 circuit flagstone located in the East Garden, the Frank Dennis Memorial 11 circuit Chartres style canvas labyrinth and a children’s labyrinth. Mindfulness is the psychological process of bringing one’s attention to the internal and external experiences occurring in the present moment. The recent popularity of mindfulness in the West is generally considered to have been initiated by Jon Kabat-Zinn, although it has been a significant element of ancient Buddhist traditions. The practice of mindfulness is strongly correlated with a greater sense of well-being in practitioners. Mindfulness classes at St. Paul’s rely upon the teachings of Jon Kabat-Zinn and others. Recent classes have included an introduction of Qigong, a system of body postures and movements to cultivate health, balance and life energy. St. Paul’s provides space for meetings of Alcoholics Anonymous on Tuesdays at noon in the library, located on the second floor of the Parish House. St. Paul’s provides space for meetings of Al Anon on Tuesdays at noon in the Undercroft of the Education Building. Al Anon meetings are about sharing individual experiences and problems caused by a loved one’s drinking. Individual stories offer hope and strength in order to solve the common problems of the group. The 12-step recovery method is used to help in the recovery from the emotional, psychological ad physical impact of alcoholism. St. Paul’s provides space for meetings of Nar Anon on Tuesday evenings at 5:30 in the Undercroft of the Education Building. Nar Anon Family Groups is primarily for those who know or have known a feeling of desperation concerning the addiction problem of someone very close. We have traveled that unhappy road too, and found the answer with serenity and peace of mind. The Nar Anon program, which is not a religious one but a spiritual way of life, is based on the 12 Steps of Nar Anon.